Sears Holdings reduced its losses last quarter -- but not enough to make any difference in the long run. Shares of Sears Holdings (NASDAQOTH:SHLDQ) soared last week after the company posted better-than-expected fourth-quarter results. This was just the latest big stock price swing for the struggling retail icon. Sears managed to reduce its losses modestly last quarter. Nevertheless, it lost a lot of money in what is typically the most profitable quarter for retailers. As a result, its earnings beat is virtually meaningless -- unlike the outperformance posted by upmarket chain Nordstrom (NYSE:JWN), for example. In early January, Sears Holdings stated that comparable-store sales had declined by double digits during the November-December holiday shopping period. In response, the company launched its latest cost-cutting effort, which includes closing 150 unprofitable stores. This news caused Sears Holdings stock to tank. However, the shares began to surge last month after the company revealed that its adjusted earnings before interest, taxes, depreciation, and amortization (EBITDA) had improved on a year-over-year basis in the fourth quarter. The recent earnings report kept this rally going. 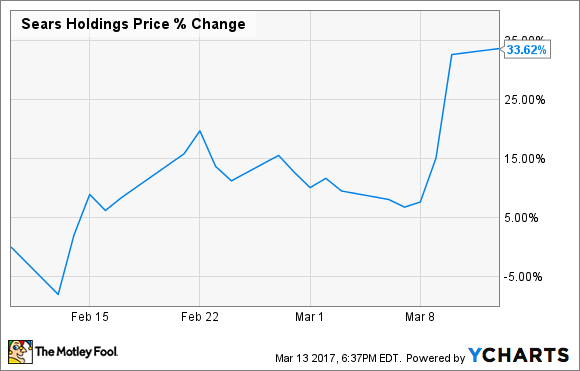 In total, Sears Holdings stock has jumped more than 30% in the past month. Last Thursday, Sears released its official fourth-quarter earnings report. Revenue plunged to $6.1 billion from $7.3 billion a year earlier, driven by store closures and a 10.3% comp sales decline. However, adjusted earnings per share (EPS) improved to -$1.28 from -$1.70 a year earlier. Adjusted EBITDA showed an even bigger improvement, reaching -$61 million, compared to -$137 million in Q4 2015. Sears Holdings' management tried to spin this as the beginning of a genuine turnaround. Based on the company's recent stock performance, it appears that many investors have bought in to this idea. However, revenue is still crashing at Sears, and that trend is likely to continue in 2017. This will blunt the impact of the company's cost cuts. Furthermore, adjusted EBITDA excludes several significant cost items, such as interest expense, pension costs, and depreciation of capital investments. Posting negative adjusted EBITDA during the most profitable quarter of the year is a big red flag under any circumstances. Indeed, for the full 2016 fiscal year, adjusted EBITDA was a loss of more than $800 million. This highlights just how far Sears is from returning to profitability. Sears is still losing lots of money. Image source: Sears Holdings. Over the past five years, Sears has sold off numerous assets, raising billions of dollars of cash and buying time for a turnaround. The company will continue this process in 2017, but its pool of real estate and other assets is starting to run dry. Unfortunately, the company is still far from reaching sustainable profitability. Whereas Sears Holdings' earnings beat is meaningless due to the company's ongoing losses, Nordstrom posted a much more significant earnings beat last quarter. Nordstrom's adjusted EPS came in at $1.27 in Q4, up from $1.17 a year earlier and about 10% ahead of the average analyst estimate. Better inventory management has helped Nordstrom to improve its profit margin recently after a string of bad quarters in late 2015 and early 2016. Nordstrom still faces significant headwinds. It expects adjusted EPS to decline modestly in 2017 despite a low single-digit revenue increase. However, at least it is still profitable and generating revenue growth -- especially through the off-price Nordstrom Rack chain -- unlike Sears Holdings. Nordstrom Rack represents a big growth opportunity for Nordstrom. Image source: Nordstrom. Strategic missteps and weak mall traffic have both contributed to Nordstrom's recent earnings declines, but the company is also facing pressure because it is investing in its future. For example, Nordstrom has spent heavily to build up a big e-commerce business. This long-term growth initiative is just starting to pay dividends. Additionally, Nordstrom has rapidly expanded the Rack chain in the past four years, cannibalizing older Nordstrom Rack stores to some extent. Lastly, Nordstrom is incurring significant pre-opening costs related to a new flagship store in Manhattan that will open in 2019. Sears is shrinking in order to improve profitability, but it's doubtful that these efforts will ever get the company back into the black. Investors should steer clear of this stock. By contrast, Nordstrom is a much more intriguing turnaround story. It, too, faces headwinds. But at least Nordstrom is working on credible initiatives to get its earnings growing again.